I’ve partnered with California Almonds on this sponsored post. As always, all opinions are my own. These Roasted Cinnamon and Nutmeg Almonds are filled with sweet flavors that pack an irresistible taste. Crunchy, sweet, and a good-for-you snack, these almonds are perfect for mid-morning or late night munchies! 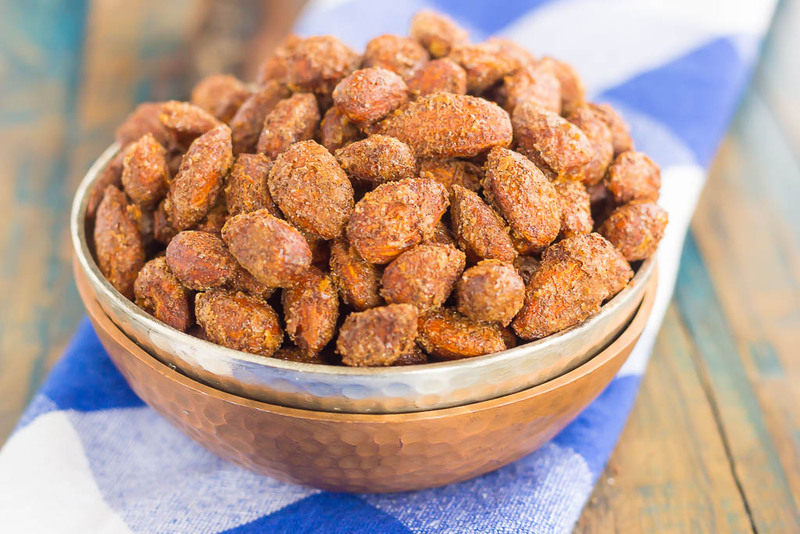 Remember when I made these Easy Chili Almonds last week? Well, I’ve been hooked on their flavor, crunch, and overall deliciousness. And by “hooked” I mean addicted…those almonds were gone in no time! So, to cure my cravings, I decided to whip up another flavor, and this time, it’s on the sweeter side. And since February 16 is Almond Day, I thought this would be the ultimate recipe to share with you today! And not only is February also Almond Month, it’s American Heart Month and National Snacking Month. How fun is that? Almonds are healthy, good for you, and extremely versatile, too. 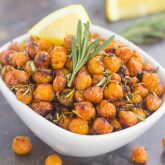 You can use them in a variety of recipes, ranging from salads, side dishes, main courses, and sweets. And if you’re on the hunt for protein, then you’ve come to the right spot. Almonds are a great snack because of their fiber, protein, and good fat. In fact, new research suggests that munching on 1.5 ounces of whole or chopped almonds every day curbs appetite without increasing your calorie intake or body weight. By eating just 1 ounce (28 grams) of almonds, you get an excellent source of antioxidants, vitamin E, and magnesium. It also provides 6 grams of protein and 4 grams of fiber. Almonds are naturally gluten-free and cholesterol-free, too. See how easy it is to bring crunch and delicious almonds into your diet? And I’m making it even easier with these Roasted Cinnamon and Nutmeg Almonds. They’re full of flavor, crunchy, sweet, and so easy to make. 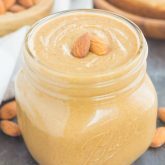 Snack on a handful in your car when you’re running errands or on the way to work, keep a few in your purse or gym bag, and even add these almonds to salads, desserts, or even meals. The possibilities are endless! Like most of my recipes, these Roasted Cinnamon and Nutmeg Almonds are a breeze to whip up. But, you knew that was coming, right? With less than 10 minutes of prep time and about 20 minutes in the oven, you can have the snack ready to be devoured in no time. So, what are you waiting for? 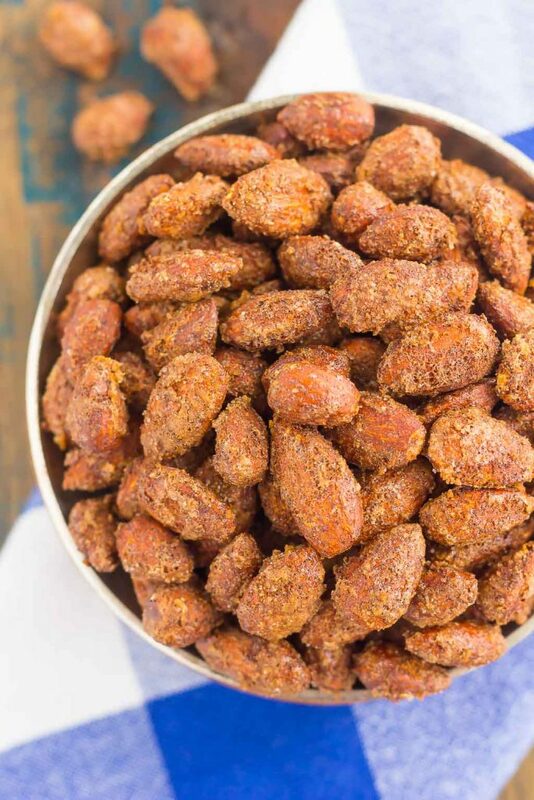 Grab those ingredients and whip up a batch of these easy Roasted Cinnamon and Nutmeg Almonds today! Want to learn more about Almond Month? 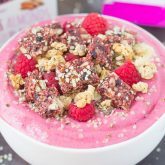 Head over to this website to get recipes and nutrition tips! Preheat oven to 300F. Line a large baking pan with parchment paper. Set aside. In a large bowl, beat egg white until frothy. Add almonds and stir to coat. Set aside. In a small bowl, stir together white sugar, brown sugar, cinnamon, nutmeg, and salt. Add sugar mixture to almonds and toss to coat. Spread almonds in an even layer on prepared baking pan. Bake for 22-25 minutes, or until almonds are lightly toasted. I didn't know today was Almond day, or that this month was American Heart Month and National Snacking Month!! Thanks for letting me know! 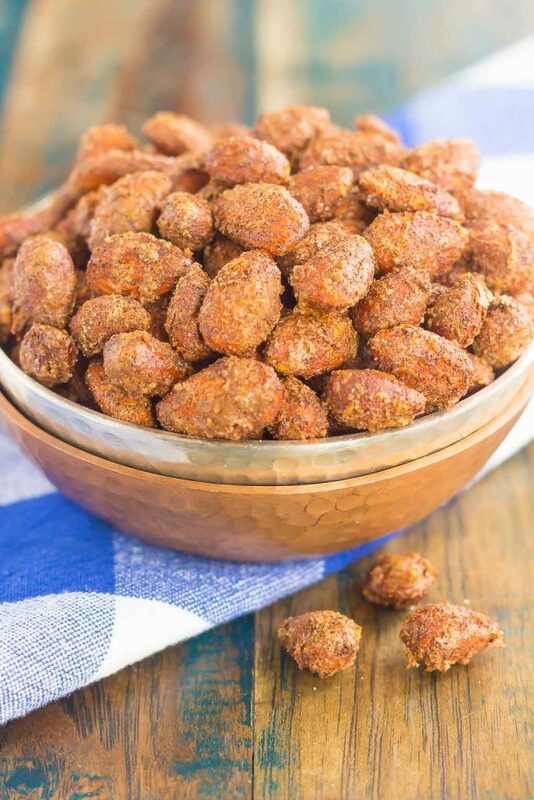 LOVE these roasted-cinnamon-nutmeg-almonds!!! Thanks for the almond love, Alice! As if I need an excuse to eat almonds! I better go ahead and eat extra today since it is National Almond Day :) I knew they were good for you , but not that good! They definitely do the job curbing hunger and it's something I often reach for, especially if I'm feeling a little hungry before bed. Love all the coating on these and cinnamon nutmeg is an awesome combination. 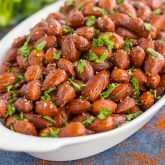 I bet these along with a few of your chili almonds would make a fantastic snack - a little spicy, a little sweet :) Pinned, of course! Hope your week is going great, my friend! Thanks for the almond love, Dawn! I love reaching for almonds as a snack, especially sweeter ones! :) Happy weekend to you! I love these! We're taking a little road trip this weekend and this will be a perfect snack! Love the sweet & spicy combination! Pinned!! Thanks, Annie! Almonds are perfect for road trips! Thanks for the sweet comment, Demeter! I'm ALL about the almonds these days! :) Happy weekend to you! Why am I not surprised Almonds have their own national day? Seems like everything under the sun has its own national day to celebrate. Gets me thinking.. is there a national food bloggers day?! Because there should be right?!! Anyways, love these almonds! Sweet and savory snack-tastic perfection going on here, Gayle!! I could easily made a gallon sized bag of these disappear in record time! Pinned of course! Cheers! Haha you are so right...I would love to see all the foods that have their own day. And there definitely should be a blogger's day! Thanks for the kind words, Cheyanne! I had no idea today was Almond Day! These are just perfect to celebrate the day too. I love that they're full of flavorful spices and that they're such a whole some snack. They look completely addicting! I had no idea February was Almond month! Or Snacking Month (I can definitely get behind that, ha!). 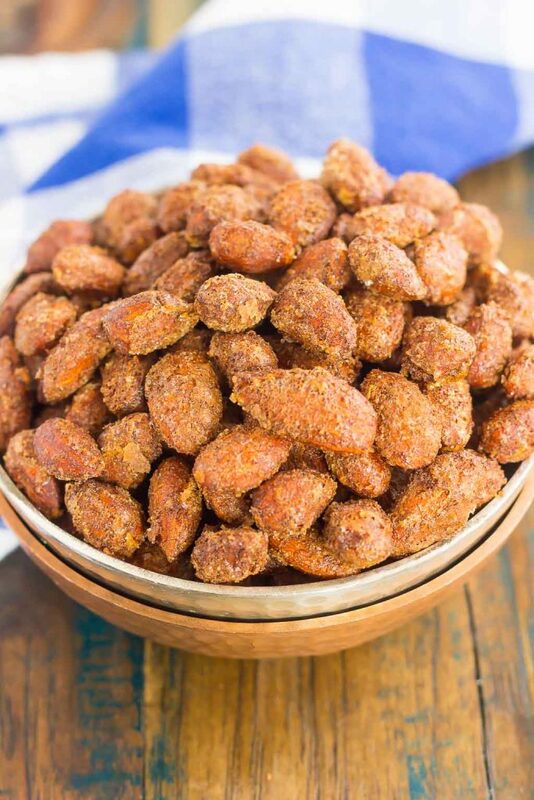 I love roasted almonds, and these cinnamon and nutmeg ones sound amazing! Plus, only 10 minutes of prep?? I'm sold! Oh goodness these look highly addictive! I never could turn down a sugared almond. Yum! I didn't know it was almond day :) Still have to try the chili flavor and then this one. Love it! Pinning! I love roasted almonds, and these sound like such a fun flavor combination, Gayle! I gosh, how I wish I had a big, sweet and savory bowl of these right now! Good and good for you!